August 30, 2017, 8:42 a.m.
Last month, Dogs Trust launched a new ad campaign which appealed for people to take in dogs that need owners. The Little Balloon Doggy ad was released on the 14th of July and tells the story of Paddy, a dog waiting in a shelter for someone to give him a “forever home”. YouGov CharityIndex data indicates that the campaign has had a good amount of cut-through with the viewing public. 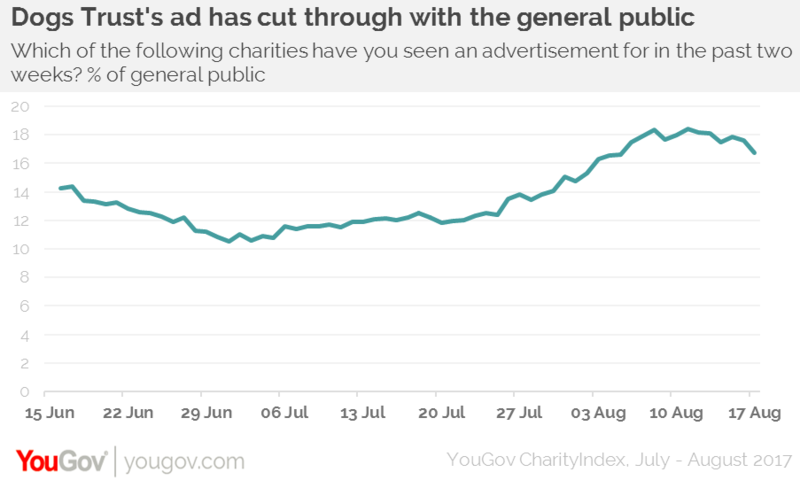 The charity’s Ad Awareness score (the proportion of people who have seen an ad for the charity in the past two weeks) has risen from 11% to 16%. Not only are people noticing the advert, but talk surrounding the charity has increased too. Dogs Trust’s Buzz score (whether or not someone has heard something positive or negative about the charity in the past fortnight) has increased from +4 to +8 in the same time period. The ad has also done well among those who consider donating to the charity – Dogs Trust’s existing audience. It has risen by 14 points – climbing from 24% to 38% since the Little Balloon Doggy first aired. Dogs Trust can be confident that their Little Balloon Doggy campaign has appealed to both its target market and the public generally.